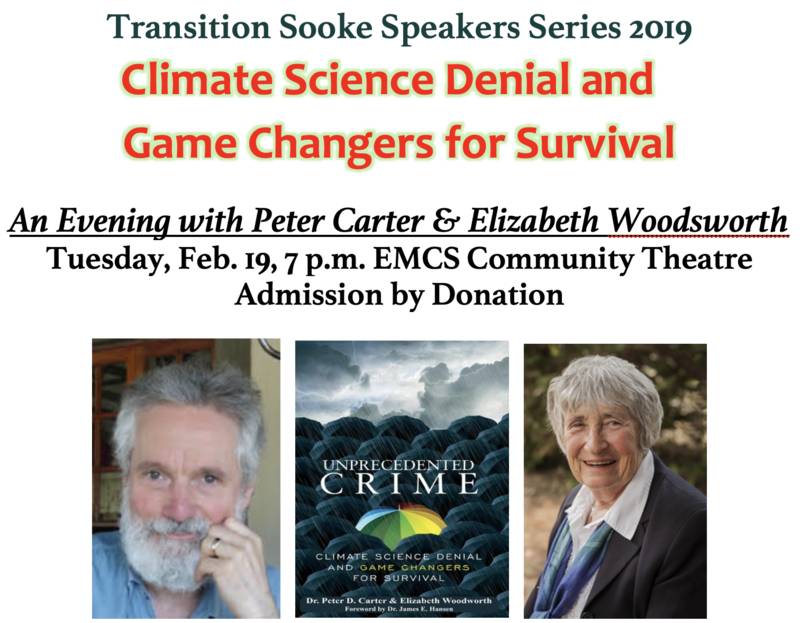 Authors Peter Carter and Elizabeth Woodworth, authors of Unprecedented Crime: Climate Change Denial and Game Changers for Survival (Clarity Press, 2018) will be addressing the book's key themes at the first in this year's Transition Sooke Speaker Series. Dr. Peter Carter has served as an expert reviewer for the Intergovernmental Panel on Climate Change's fifth climate change assessment in 2014. He has presented on climate change issues (especially the implications of global climate change on food security for the world's most vulnerable regions and populations) at science and policy conferences in Canada, the United States, Europe, Asia and South America. He was a family and emergency medicine practitioner before retiring to focus on the climate crisis for the sake of his sons and their children.